Tandem skydiving is the most popular way to experience skydiving for the first time here in the US. Because it’s the only way to experience skydiving with as little as 20 minutes of training. When you make a tandem skydive, you’re attached to a highly experienced tandem instructor, who is responsible for the operation of all the equipment. Though you have some responsibilities (such as adopting the correct exit position and lifting your legs for landing), on the whole, you’re job is to relax and enjoy! Skydiving wasn’t intended to be the amazing sport it is today. In fact, the very first skydivers were the military, tasked with depositing supplies and entering areas which would have been difficult to reach without the help of a parachute. And that meant much of the development of skydiving and parachuting in the early days was focused on making landings easier – not on making jumping more fun! It wasn’t until the late 1970’s that the first tandem skydiving system was developed, enabling two people to jump attached to one another. In the early 1980’s, tandem skydiving received a waiver from the FAA with experimental status. That’s when tandem skydiving really started to take off. Today, more than 500,000 people jump every year. Isn’t it about time you became one of them?! Tandem skydiving is a lot of fun. For our tandem skydive teams (including the instructors and camera flyers), being there to take someone through their very first skydive is a major honour. We’re always so excited to see first reactions to our sport! Tandem skydiving has really made our sport accessible to the masses. What was once considered an act reserved only for absolute daredevils is today more like taking a ride on a rollercoaster – it’s almost a normal occurrence (almost!). By making skydiving available to more people, tandem skydiving has helped the sport as a whole to progress. With more people making skydives, there are more opportunities to develop new technologies and products. Things like AADs (automatic activation devices) have been created since tandem skydiving started – this device automatically deploys a parachute in the event that the skydiver hasn’t done so themselves by a safe height. Many drop zones have been able to grow and improve their facilities as a result of the increased volume of jumps through tandems – in fact, many drop zones wouldn’t even exist today if they hadn’t been responding to a rising appetite for tandems. Tandem skydiving is also a gateway to the sport. It’s common for people who’ve tried it once to want to come back and jump again. In fact, many of our country’s greatest skydivers started with a tandem jump! For starters, it’s an incredible experience. Unlike anything you’ve done before. Believe us, there’s nothing in the world like looking out of an airplane door and then jumping through it. The rush of the wind, the incredible views, the adrenaline pumping through your veins… it’s exhilarating and so exciting! Perhaps your tandem skydive is a celebration of something like a big birthday, or an achievement of some kind. What better way to mark a special occasion than with a once-in-a-lifetime experience? For many of the people who jump with us, tandem skydiving isn’t an easy thing to do. It’s no secret that jumping from an airplane is scary the first time. To be honest, it can still get the nerves going after thousands of jumps! If you’re at all scared or nervous of skydiving, that step out of the door is worth so much more. It’s an achievement in itself. It’s proof of your ability to overcome challenges, conquer your fears and benefit from an awesome experience as a result. Once you’ve tried tandem skydiving, you’ll always know that you were able to do something that most people are still yet to try. It can be very empowering – and addictive! Hopefully, by this point, you’re convinced that skydiving is for you! Once you start thinking about booking, there are a few things to bear in mind. The first thing is altitude. In skydiving, the higher the altitude, the better. Try to find a skydiving center that goes to at least 13,000 feet – that will give you around a minute of freefall time, followed by five minutes or so under parachute. Choosing a skydiving center can be daunting. You want somewhere convenient to you, but you also want to know you’re going to have the best experience possible. Our advice is to pick a USPA affiliated drop zone; this means choosing a center that’s approved by the United States Parachute Association, that guides the sport in our country. USPA drop zones have a responsibility to conform to regulations that are in place to keep us safe. Watch for pricing, too. 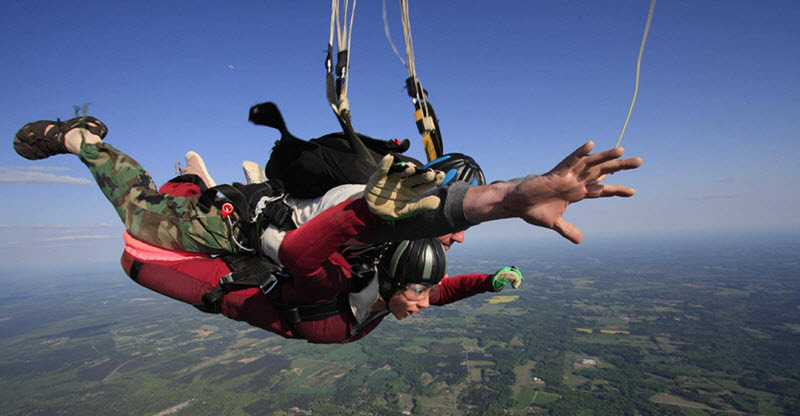 In the skydiving industry, there’s a wide range of skydiving centers that vary in price. You want the best deal, but in skydiving, you don’t want to look for the cheapest. Remember, ours is a sport that requires high-quality gear and the very best aircraft. Prices should reflect that. Be sure to check reviews before you jump as well. Understanding the experience that other people have had at the center gives you a good indication of the kind of experience you can expect. Are you ready to make your tandem skydive? Book today, or get in touch if you have any questions. We’ll be happy to help.